in more detail in addition to dealing with a number of matters not mentioned in the short version. Almost everyone admits that an Exodus occurred. But the details of the journey are presented in such a way that relating them either chronologically or geographically to known historical data is indeed difficult. DIFFICULT, INDEED. But not impossible. After all, we have established that Israel's journeys took them into ancient Midian (Where is Mount Sinai?) and we have a clear bead on one location mentioned on the route of Israel's journey — Ezion Geber (Num. 33:35). Add a known starting point and a known end point, and you're half way there. This article has the limited purpose of making sense of the biblical data about the route taken by the Israelites after leaving Mount Sinai and so, by extension, to making a contribution to the cause of the Bible's credibility. Rejectionists ridicule the biblical narrative as riddled with error. Oh that they would cease from their stubbornness and approach the Word of God with fear and trembling; then they would see and sing God's praises rather than continuing to stumble in the dark. Golgotha hill is of infinitely more significance than towering Mount Sinai, and Jesus' short walk to Calvary of immeasurably greater moment than Israel's forty years wilderness march. Nevertheless, after the atoning and saving work of the only Son of God, the redemption of Israel from Egypt and her eventual safe arrival in the land promised to Abraham's seed must go down as the ultimate historical event. So we departed from Horeb [Mount Sinai], and went through all that great and terrible wilderness which you saw on the way to the mountains of the Amorites, as the Lord our God had commanded us. Then we came to Kadesh Barnea. And I said to you, “You have come to the mountains of the Amorites, which the Lord our God is giving us. Look, the Lord your God has set the land before you; go up and possess it…"
It would appear that they arrived there about twelve months after departing Mount Sinai, two years after leaving Egypt in what has become known as "the Exodus". Soon after, disaster struck. From Kadesh Barnea, Moses sent spies to reconnoiter the land. When they returned, they tarnished their glowing report of the land's superb assets with fearful accounts of the prowess and overwhelming strength of its inhabitants, many of whom were so tall the spies felt like grasshoppers by comparison (Num. 13). The people felt so sorry for themselves they refused to budge (Num. 14). At that point, God postponed the conquest, sentencing the entire nation to a total of forty years of rough country living, during which time every person who had been over the age of twenty upon departing from Egypt would die (Num 14:26-35). Ahead of them lay thirty-eight more years of wandering in unfamiliar surroundings. Many of those years were to be spent in Kadesh Barnea. So you remained in Kadesh many days, according to the days that you spent there. Taking the highly-influential medieval French rabbi, Rashi, as their source, some Jewish commentators take the clause “according to the days that you spent there” to mean that they spent as much time there as they did at all other places combined. Thus, they spent a total of nineteen years at Kadesh Barnea. Makes sense, doesn't it? They moved from Ezion Geber and camped in the Wilderness of Zin, which is Kadesh (vs. 36). One could certainly be forgiven for taking this Kadesh to be one and the same as the Kadesh Barnea already discussed. Numbers 13 and 14, which speak unmistakably of events that occurred at Kadesh Barnea, show that it was sometimes referred to as simply “Kadesh” (13:26). And since no other Kadesh is referred to in Numbers 33 before the Kadesh mentioned in verse 36, it makes sense that this Kadesh is the same as the Kadesh Barnea spoken of in earlier chapters of Numbers. But it isn't; it's a different Kadesh, as an examination of various lines of evidence will show and as is recognized by a number of Bible students, particularly Jewish. One must conclude that Kadesh Barnea is listed in Numbers 33 under a different name. Working with average distances between stations suggests that Terah (Num. 33:27) is the most likely candidate, but we cannot know. Frankly, it doesn't really matter. One must conclude that Kadesh Barnea is listed in Numbers 33 under a different name. Alternatively, Kadesh Barnea could be a specific name, possibly of a watering hole or the like, that was located in a district of a different name, in the same way that San Rafael is a city in Marin County, and Numbers 33 uses the district name. In short, the lack of appearance of the name “Kadesh Barnea” in verses 16-35 of Numbers 33 is no major impediment to the view presented here. It is eleven days' journey from Horeb by way of Mount Seir to Kadesh Barnea. This map provides an overview of the journeys of the Israelites between Mount Sinai and the Plains of Moab. These clues won't enable us to triumphantly thrust a pin into the map but will give us a very helpful guideline which can be further refined by other hints. How far was a day's journey? Nobody knows for sure, but we can be fairly confident of establishing a range of possibilities. We will take the position found in The Illustrated Bible Dictionary, which says, “Presumably a day's journey was between eighteen and twenty-five miles”. Using this range as our guide leads us to search for Kadesh Barnea somewhere between 200 (198 to be precise) and 275 miles walking distance from Mount Sinai along the most logical route. The Deuteronomy passage reveals that the Israelites traveled “by way of Mount Seir”. The Hebrew construction, derekh ha-Seir, can be read a few different ways.  they took the road to Mount Seir or, as a proper noun, “the Mount Seir Road”. We propose that the evidence suggests that in this passage the term is referring specifically to a road that served as a major trading route linking the fabled land of Sheba and other regions in the south-west of Saudi Arabia with Egypt, the Levant, and Syria (the NIV interpretation). This ancient caravan route began in Shabwa in southwestern Arabia and swept north parallel to the Red Sea coast passing through the El-Ola oasis on the way. See Figure 4 for an overview of the route. Commonsense suggests that the Israelites followed this trading road leading to Mount Seir for at least part of their march towards Kadesh Barnea. Whether they stopped shy of Mount Seir or shot beyond it cannot be determined from the direction component of the Deuteronomy passage. Figure 5 outlines the most likely route taken by the Israelites, in the rough, from Har Kodesh towards Kadesh Barnea. We are going to find Kadesh Barnea somewhere in the direction of Mount Seir, between roughly 200 and 275 miles from Har Kodesh2 taking the most sensible route, first, from Har Kodesh to the trade route and then, second, following the trade route, Mount Seir Road, towards Edom, and possibly beyond. No guesswork is required to figure out the route taken from Har Kodesh to the Mount Seir Road. The reader is encouraged to dust off Google Earth and paste these coordinates into it: 27 50 38 35 35 25. Zoom in or out as needed to an eye altitude of about 8 miles (12 kilometers). You are looking at the western edge of the Mount Sinai camping area. Now make sure "Roads" is enabled and you will see a faint yellow line running through the camping area. This line marks out the path of a road running generally east-west and which connects two major north-south highways. The Israelites would undoubtedly have taken the same route. Follow this road towards the east until it meets Highway 80.3 (See Figure 6.) From here to the top of the plateau is another four miles. The first stop upon reaching the plateau was Kibroth Hattaavah. When the Israelites whined about the lack of meat here, God whipped up a quail tempest (Num. 11:31). In sum, we can establish a 75-mile, north-south zone of potentiality for the location of Kadesh Barnea. See Figure 7 for clarification of the range of potential sites. Where, then, is Kadesh Barnea ? Can we narrow down its likely location any further than we have already done? Yes, we can. To do so requires introducing a totally new idea into the equation: in Moses' day, a tiny territory occupied by Canaanites and Amalekites was sandwiched between the petty states of Edom (Mount Seir) in the south and Moab in the north. For the sake of convenience, we will dub this territory Canamalia — a better choice, wouldn't you agree, than the logical alternative, Amoria. We propose that Kadesh Barnea lay a little east of Canamalia's eastern boundary. We propose that Kadesh Barnea lay a little east of Canamalia's eastern boundary. On what basis can we posit the existence of the Amalekite/Canaanite kingdom of Canamalia? How does this proposal aid our cause? The argument is straightforward enough. Consider these points. You have come to the mountains of the Amorites, which the Lord our God is giving us. Look, the Lord your God has set the land before you; go up and possess it, as the Lord God of your fathers has spoken to you; do not fear or be discouraged. Neither Edom nor Moab was on Israel's radar screen as part of their divinely-ordained possession; Israel was not to inherit “a foot's worth” of either territory (Deut. 2:5, 9). If these states were joined at the hip, thus creating a continuous wedge separating Kadesh Barnea from the Holy Land to the west, Moses could not have said, “You have come to the mountains of the Amorites”. Canamalia solves the problem simply and elegantly. This “mountain of the Amorites” consisted of an extension towards the east of territory occupied by Canaanites and Amalekites in the northernmost part of the valley of the Arabah(Num. 14:25). And they rose early in the morning and went up to the top of the mountain, saying, “Here we are, and we will go up to the place which the Lord has promised, for we have sinned!” And Moses said, “Now why do you transgress the command of the Lord? For this will not succeed. Do not go up, lest you be defeated by your enemies, for the Lord is not among you. For the Amalekites and the Canaanites are there before you, and you shall fall by the sword; because you have turned away from the Lord, the Lord will not be with you”. But they presumed to go up to the mountaintop… Then the Amalekites and the Canaanites who dwelt in that mountain came down and attacked them, and drove them back as far as Hormah (Num. 14:40-45). This account shows that from their camp at Kadesh Barnea they had to “go up” into “the top of the mountain/highlands”. The proposed location of Kadesh Barnea, soon to be revealed, is at an altitude of about 850 meters, while Canamalia is around 1200 meters elevation, requiring that they “go up” to reach it. Equally important in supporting this location is Deuteronomy 1:44, which states that the enemy, “drove you back from Seir [Edom] to Hormah”. In spite of the uncertainty surrounding Hormah's whereabouts, this battlefield description suggests that the Israelites attempted to storm the highest peak in Canamalia (1480 meters)10 located a stone's throw from Canamalia's proposed border with Edom, but were beaten back from Edom. Fits perfectly. So Jephthah again sent messengers to the king of the people of Ammon, and said to him, “Thus says Jephthah: ‘Israel did not take away the land of Moab, nor the land of the people of Ammon; for when Israel came up from Egypt, they walked through the wilderness as far as the Red Sea and came to Kadesh. Then Israel sent messengers to the king of Edom, saying, “Please let me pass through your land.” But the king of Edom would not heed. And in like manner they sent to the king of Moab, but he would not consent. So Israel remained in Kadesh. And they went along through the wilderness and bypassed the land of Edom and the land of Moab, came to the east side of the land of Moab, and encamped on the other side of the Arnon. But they did not enter the border of Moab, for the Arnon was the border of Moab'” (Jdg. 11:14-18). Jephthah, a judge of Israel, spoke these words a couple of hundred years after Moses' time. Note carefully that the Israelites bypassed both Edom and Moab when their respective kings refused to give permission to pass through their territory. With these facts up our sleeve, we are virtually forced to draw the same conclusion as before; an Amorite enclave separated Moab in the north from Edom in the south. For some unexplained reason, the Israelites were able to ascend unimpeded through this rugged territory to bring them to the east of Moab even though, nearly forty years earlier, they had exchanged blows with Canamalia's inhabitants. Time can do strange things when it comes to international relations. Finally, we are ready to narrow down the location of Kadesh Barnea: it must lie east of Canamalia. If our theory as to the location of Canamalia's northern and southern borders along natural topographic features is correct, then the eastern border of Canamalia lay roughly between the modern towns of Al Hasa in the north and Jurf Al Darawish11 to the south. Now we're getting somewhere. But we can narrow our search down much further. What one requirement above all others is essential to life? You're right. Water. So fire up your Google Earth and looky here: 30 48 37 36 00 34. You have an area of about three square miles covered with trees. Trees mean water. Figure 10 provides a view of the trees from about 5 miles in altitude. The water from here flows west, going right through the center of Al Hasa. Following the bed further west shows that flowing water coming from the woods has, over time, cut into the bedrock. Even an ephemeral flow would have sufficed to provide a permanent supply if cisterns were dug or impoundments built. The evidence piles up to suggest we can place Kadesh Barnea somewhere in the vicinity of the extensive woods near the modern town of Al Hasa. The modern Desert Highway right nearby probably traces the route of an ancient trading road. Before the Israelites arrived, Kadesh Barnea may well have been a resting place for merchants. It fits. Who can see any fatal flaws? From here on, the names Kadesh Barnea and Al Hasa will be used interchangeably.  Kadesh Barnea to Kadesh.  Kadesh to Zalmonah. This particular section is very difficult to reconstruct, but it has to be done. Be prepared for some surprises.  Zalmonah to the Jordan River. Although we can trace the route taken from Har Kodesh to Al Hasa with some confidence, marking the stopovers on a map would be a matter of guesswork. The picture begins to change with Moserah, or Moseroth (Num. 33:29), fifteen campsites from Mount Sinai and six stops before reaching Ezion Geber. From Moserah we can make some seriously educated guesses. Figure 11 gives an overview of the circuitous path, split into four stages, taken from Mount Sinai to the Promised Land. Then we turned and journeyed into the wilderness of the Way of the Red Sea, as the Lord spoke to me, and we skirted Mount Seir for many days (Deut. 2:1). They departed from Abronah and camped at Ezion Geber. And the Lord spoke to me, saying: “You have skirted this mountain long enough; turn northward” (2:2-3). The words spoken here were said to Moses at Ezion Geber. So, when they left Kadesh Barnea they travelled south roughly parallel to the eastern boundary of Edom, eventually arriving at Ezion Geber. Here, God told them to turn northward. They did not retrace their steps back up the eastern side of Edom but now they headed north up the Arabah along the western side of the Mount Seir escarpment. In spite of the heat, people lived in the Arabah. One such settlement was Kadesh, already spoken about. Taking as our guide the reasonable notion that cities in the Arabah existed to provide succor and supplies to traders, towns would invariably have been placed where trading routes intersected. A trading road ran along the bed of the Arabah from Ezion Geber to the southern end of the Dead Sea where it branched; we will call it the Arabah Road (based on the RSV translation of Deuteronomy 2:8). Kadesh no doubt stood somewhere along the Arabah Road where it was crossed by another trade route. In spite of the heat, people lived in the Arabah. Figure 12 shows all the roads spoken of in this article as well as showing, in blue, the proposed trading trail linking the Arabah Road with the King's Highway. Figures 13 and 14 are Google Earth images illuminating this proposed trail. Figure 13 is a view from Kadesh to the start of the trail, while Figure 14 provides a closeup of the landscape a little way further along. Finally, Figure 15 gives a bird's-eye view of the trail, slightly offset from its actual position to highlight the path, all the way from Kadesh to the start of the King's Highway. The significance of this trail will become evident shortly. They moved from Kadesh and camped at Mount Hor, on the boundary of the land of Edom. Then Aaron the priest went up to Mount Hor at the command of the Lord, and died there in the fortieth year after the children of Israel had come out of the land of Egypt… (Num. 33:37-38). Now the children of Israel journeyed from the wells of Bene Jaakan to Moserah, where Aaron died… (Deut. 10:6). You don't have to have a PhD in quantum physics to grasp that either Mount Hor and Moserah are two names for the same place, or that Moserah was a township/trading centre located near a peak known as Mount Hor. To establish the location of Moserah we need to find a suitable peak east of the escarpment. If our whole thesis contains any weaknesses, it is at this point. 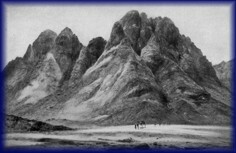 By contrast with the rugged escarpment making up the western part of Mount Seir, which provides many peaks that could be labeled “mountains”, the eastern borderlands of Edom are by and large monotonously flat, presenting no peaks that could pass as a mountain by our way of thinking. The problem is not, however, intractable. The solution lies in recognizing that a “har”, in Hebrew, can be practically anything from a knoll to a hill to a majestic peak. Any prominence that juts above its surroundings is a “mountain”. If our whole thesis contains any weaknesses, it is at this point. Using the color-by-altitude feature in Natural Scene Designer yields a hillock at 30 12 20 35 36 07 rising a couple of hundred feet above its surroundings. Though its height leaves a little to be desired, its location shows promise, lying close to the border of Edom. A settlement at this junction would undoubtedly have served as a major merchants' stopover. The Israelites probably camped as close as was practical to this site. The trail coming from Kadesh mentioned earlier would also have converged at this point (Figure 15). It all fits. The Israelites seem to have left the Red Sea Road at Bene Jaakan and headed south and slightly east, passing through Hor Hagidgad and then stopping at Jotbathah. The latter can almost certainly be associated with the famous Jordanian holiday destination renowned for its spectacular scenery, Wadi Rum. Deuteronomy 10:7 describes Jotbathah as “a land of rivers [wadis] of water”. Since no location in that part of the world could possibly enjoy a lot more rain than nearby locations, one must conclude that at least some of the water in this “land of wadis of waters” must have come from a source other than rain. The only answer can be groundwater. A large aquifer underlies this area of Jordan and neighboring Saudi Arabia. Cracks in the bedrock separating the aquifer from the surface may have allowed water to percolate all the way to the surface in Moses' day. This idea is supported by the fact that water flows slowly but perceptibly from the Saudi side into Jordan. Today it doesn't quite get to the surface at Wadi Rum because it is being pumped out faster than it can make its way upwards; one third of the precious resource has already been used up. By comparison, the task of reconstruction has been duck soup up until now. Then the children of Israel, the whole congregation, journeyed from Kadesh and came to Mount Hor (Num. 20:22). Are we saying that when they left Mt Hor they once more headed south towards the Red Sea, circling around the land of Edom again before finally returning yet again to the Arabah? Yes, that's what it seems to be saying. This apparent doubling back over old territory presents quite a puzzle. We propose that this puzzle can be solved reasonably easily. Now Moses sent messengers from Kadesh to the king of Edom. “Thus says your brother Israel: ‘You know all the hardship that has befallen us, how our fathers went down to Egypt, and we dwelt in Egypt a long time, and the Egyptians afflicted us and our fathers. When we cried out to the Lord, He heard our voice and sent the Angel and brought us up out of Egypt; now here we are in Kadesh, a city on the edge of your border. Please let us pass through your country. We will not pass through fields or vineyards, nor will we drink water from wells; we will go along the King's Highway; we will not turn aside to the right hand or to the left until we have passed through your territory.' “ Then Edom said to him, “You shall not pass through my land, lest I come out against you with the sword” (Num. 20:14-18). So the children of Israel said to him, “We will go by the Highway, and if I or my livestock drink any of your water, then I will pay for it; let me only pass through on foot, nothing more” (Num. 20:19). Then he said, “You shall not pass through.” So Edom came out against them with many men and with a strong hand (Num. 20:20). In the panic that ensued, the Israelites fled toMoserah. So they departed from Mount Hor and camped at Zalmonah (Num. 33:41). Zalmonah must be located somewhere in the northern Arabah. To get there from Mount Hor, the Israelites had to circle around Edom (Num. 21:4), this time giving it as wide a berth as practicable. Based on the testimony of Deuteronomy 10:6-7, we can add these details. From Moserah they trekked south to Gudgodah (Hor Hagidgad) and on to Jotbathah (Wadi Rum), this time bypassing Bene Jaakan-of-the-bad-memories. 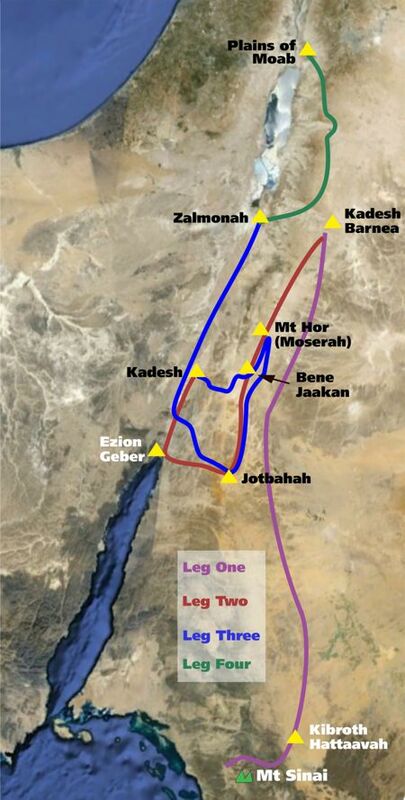 From Jotbathah they made their way to the Arabah, presumably taking the shortest possible route, and on to Zalmonah. This strange portion of the journey is clarified by examining Figure 18. And when we passed beyond our brethren, the descendants of Esau who dwell in Seir, away from the road of the plain [Heb., Arabah], away from Elath and Ezion Geber, we turned and passed by way of the Wilderness of Moab… Then the Lord said to me… “Now rise and cross over the Valley of the Zered.” So we crossed over the Valley of the Zered (Deut. 2:8-9, 13). Once they had arrived in the Arabah from Jotbathah, they travelled “away from… Ezion Geber” — in other words, north, to Zalmonah. We have finally reached a point in the narrative of Israel's wanderings where everybody agrees about the general picture. From Zalmonah, somewhere in the north of the Arabah, the Israelites climbed eastwards up to the Jordanian plateau, then turned north, travelling east of Moab until they had passed Moab's northern border, the Arnon River (modern Wadi Mujib). North of Moab lay the states of Heshbon and Bashan. Israel defeated the armies of both these states (Deuteronomy 2 &3) and finally came to rest in the “plains of Moab” just east of the Jordan River. The details are still up for grabs and remain the source of considerable debate. Figure 19 gives what must be a reasonably accurate account of this leg of the journey. For forty years the Israelites bore the shame of their rebellion, living under conditions of considerable hardship. In the first 39 years of their wilderness odyssey, they walked about 380 miles. In the last twelve months, they covered around 315 miles. The biggest challenges lay beyond Mount Sinai and Kadesh Barnea — in the Promised Land . If you found this article of interest, you will want to read "Somewhere, over the Red Sea", which traces the movement of the Israelites from Egypt to Mount Sinai. Also, serious students of the Exodus may wish to read the full version of this paper.